More than 200 firefighters, backed up by 40 fire engines, fought for hours to try to bring the Grenfell Tower block blaze - one of the most treacherous seen in London for a generation - under control. More than 200 firefighters fought for hours to try to bring the London building blaze under control. At least 12 people died in the huge fire that engulfed a London tower block on Wednesday and the toll is likely to rise further, police said. "Sadly I can confirm that there are now 12 people who have died, that we know of, this is going to be a long and complex recovery operation and I do anticipate that the number of fatalities will sadly increase beyond those 12," Police Commander Stuart Cundy told reporters. London mayor Sadiq Khan said the fire raised questions about the safety of high-rise blocks like Grenfell Tower while the scale of the disaster could delay the announcement of a deal by Prime Minister Theresa May to stay in power. 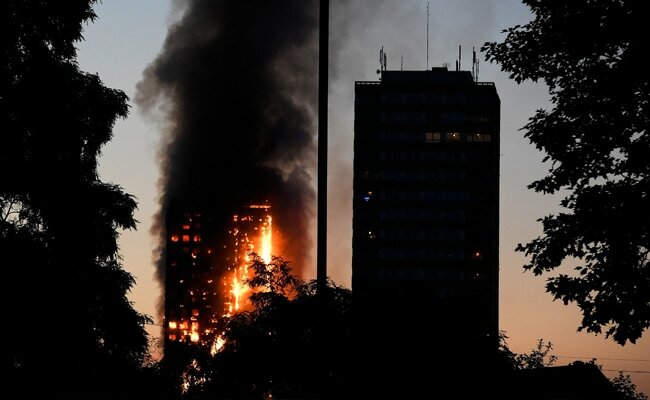 Some residents screamed for help from behind upper-floor windows, some tried to throw children to safety, as flames raced through the high-rise Grenfell Tower block of apartments in the north Kensington district just before 1 a.m. (0000 GMT). "We could see a lot of children and parents screaming for 'Help! Help! Help!' and putting their hands on the window and asking to help them," Amina Sharif, a witness, told Reuters. "We could do nothing and we could see the stuff on the side was falling off, collapsing. We were just standing screaming and they were screaming." Another witness, Saimar Lleshi, saw people tying together sheets in an attempt to escape. "I saw three people putting sheets together to climb down, but no one climbed down. I don't know what happened to them. Even when the lights went off, people were waving with white shirts to be seen," Lleshi said. The ambulances service said 69 people had been taken to hospital and 18 were in critical care. Police Commander Stuart Cundy cautioned the death toll was likely to rise. Firefighting crews were still trying to douse flames as they sought to reach the top floors of the building over 10 hours after the fire started. "In my 29 years of being a firefighter, I have never ever seen anything of this scale," London Fire Brigade Commissioner Dany Cotton told reporters. The cause of the inferno, which left the tower block a charred, smoking shell, was not immediately known. Some residents said no alarm had sounded. Black smoke billowed high into the air for hours after the blaze broke out. There were reports that some residents leapt out of windows to escape the flames. Tamara, one witness, told the BBC: "There's people, like, throwing their kids out, 'Just save my children, just save my children!'". Prime Minister May said her thoughts were with all those affected by the fire. Opposition leader Jeremy Corbyn said sprinkler systems should be installed in such blocks and called on the government to make a statement in parliament. Firefighters rescued large numbers of people - some of them in their pyjamas - from the 43-year-old block, a low rent housing estate which overlooks upscale parts of the Kensington area. The block had recently undergone an 8.7 million pound ($11.08 million) refurbishment of the exterior, which included new external cladding and replacement windows. Khan, the London mayor, said questions needed to be answered about the safety of tower blocks after some residents said they had been advised they should stay in their flats in the event of a fire. "What we can't have is a situation where people's safety is put at risk because of bad advice being given or if it is the case, as has been alleged, of tower blocks not being properly serviced or maintained," Khan said.